The setup is as above. 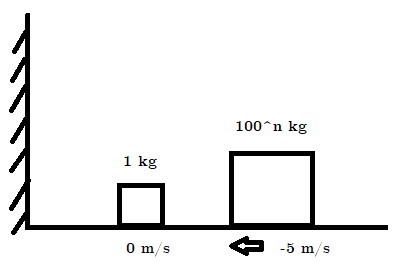 A "small" body of unit mass is at rest on the left and a "large" body on the right is moving towards the left (the initial positions and velocities are irrelevant). Assuming perfectly elastic collisions and that the large body's mass to be the n-th power of 100, where n is a natural number, the total number of collisions is always floor(pi*(10n)). # -5 units/s and has mass equal to 100^n, where n is user-specified. # since if that's true, only the first if statement would be executed. The biggest headache was dealing with float's precision issues. For example, for a collision to register, the updated positions of the two blocks should exactly be the same. But with float's rounding issues, there would be a slight difference in the positions and the program would go haywire. Even though this was corrected by using the Fraction data type, the run time of the program is really slow. If n=2, the program finishes within milliseconds, whereas for n=3, it takes a whopping 115 seconds. I'm not really aware of all the nuances of Python nor do I have any computer science knowledge, so I'd be really grateful if I can get some guidance on how I can improve the code. Off the top of my head, perhaps using Fraction affects the run time, or I wrote the if conditions in a clumsy way, or wrote redundant code. I'm confused because there are many possibilities. In the first video I linked to, at around the 2:00 min mark, there's a simulation of collisions between 1 kg and 1003 kg, and it's so smooth and quick! P.S. I used the Block class just to improve readability. I've tried using a simple list instead of a Block class object, but that only shaves off around 8 seconds or so. Not much improvement. I also tried using the numpy double data type - again, same rounding issues as with the default float type. If n=2, the program finishes within milliseconds, whereas for n=3, it takes a whopping 115 seconds. Do you know about big-O notation? Just off the top of my head after watching that video: for n=2 you're computing the number of collisions for a 1kg block and a 100**2 = 10,000kg block, which we know from the video should be 314 collisions. For n=3 you're simulating 3141 collisions. That's 10 times as many collisions, simulated one at a time, so it should take 10 times as long. In general your program is going to take O(10n) steps to compute its result. So you shouldn't be surprised if it gets real slow real fast. However, you're saying the difference between n=2 and n=3 is a factor of more than 100. That's surprising. I think you're right to blame Fraction — that is, you're dealing with much bigger numerators and denominators in the n=3 case, and bigger numbers naturally take more time to manipulate. In general I like your use of chained comparisons... but why did you almost invariably put the biggest number on the left and the smallest on the right? That's backwards from how we usually write number lines. Notice that you don't need parens around the condition of an if or elif in Python, and so it's not usual to write them. You didn't use Fraction here. Was that an oversight? Also, if this is a floating-point division, I might want to blame "repeated conversion from Fraction to floating-point and back" for some of your performance problems. Actually, hang on; back up! That comment is ridiculously untrue! The object on the left is at rest at x = 3.2 (or x = 3 if you're in Python 2), and the object on the right starts off at x = 7.5 with velocity -7 units per second, not -5. So the comment is completely wrong. Besides, starting the big block with anything other than "velocity -1" is just wasting bits and CPU cycles. Who wants to multiply anything by 32/10 when you could be multiplying it by 1? I changed your timeToNextCollision() to timeToNextCollision(small, large), passing the blocks to it as parameters, since it needs to look at the blocks in order to know what to do. This makes it very clear that you're taking the min of three things, not the usual two — and also you're constructing a Fraction from one argument, not the usual two. If this is intentional behavior, then the indentation is important because it communicates to your reader, "Hey, I know what I'm typing, don't worry" — and if this is unintentional behavior, then hey, you just found one of your bugs! Finally, let's fix your performance issue. As I said, I assume that your program takes so long because you're manipulating gigantic numerators and denominators. Above about 2**64 (or maybe 2**32, I'm not sure), Python is going to switch from native integer representation to bignum representation, and get super slow. Reading the fractions docs tells me that there's a limit_denominator method that's used precisely to keep the numerator and denominator small. So let's use it! # Here's the new code! I would like to explain why my code has a better implementation of the problem. one thing to understand is that all possible collisions will be over when the right side block is moving right and the left block is also moving right with a lower velocity. this situation will continue till infinity. Also, we dont need the position parameter at all as we only need to check velocity change to know a collision. The case when the left block is moving towards the wall has also been considered in the last if statement where i reverse its velocity. I am new in this forum and if any changes are needed, just leave a note and will do the same. I am a beginner to programming and can code only in MATLAB. I found this problem interesting and hence tried solving it. %Written by Shubham Wani, Mechanical Undergrad at NIT Trichy. the comments are self explanatory. Not the answer you're looking for? Browse other questions tagged python performance simulation numerical-methods physics or ask your own question.